Meatless Monday will have to take a week off. Sorry, I promise I will get back on track next week. 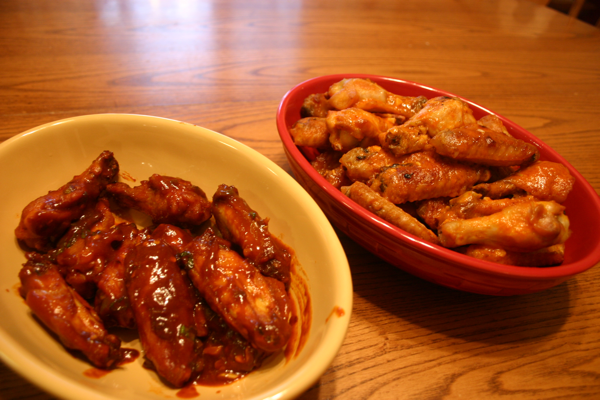 In honor of the Super Bowl last night, I am posting Jeffrey’s buffalo wings. William (and Jeffrey) love buffalo wings and they thought we really should have some for the small gathering we had to watch the game. I searched for a “healthy” recipe, and while I found the recipe Jeffry was definitely the one who implemented this treat. The recipe originally came from Alton Brown, and I was really excited to give it a try. The recipe does have quite a few steps but overall I believe it is definitely worth the effort. We had crispy, tender wings with just the right amount of kick. I know you probably have had your fill of “party” foods but this one is really worth your time when you need your fix. Place a saucepan, with a steamer basket and 1 inch of water in the bottom, over high heat, cover and bring to a boil. Place the wings in the steamer basket (in batches to insure even cooking), cover, reduce the heat to medium and steam 10 minutes. Remove the wings from the steamer basket and place on paper towel lined sheet pan to dry. One all of the wings have steamed and been put on the sheet pan place in the refrigerator uncovered to dry for 1 hour. While the chicken is roasting, melt the butter in a small bowl with the garlic. Pour this along with the hot sauce into a bowl large enough to hold all of the chicken and stir to combine. Remove the wings from the oven, transfer to the bowl and toss with the sauce. Once they have been coated with the sauce put them back on the sheet pans and heat in the oven just to warm with the sauce. Put in bowl and top with any remaining sauce. Serve warm. 3 Comments on "Buffalo Wings"
Melt the butter in a sauce pan and then saute jalapeno and garlic for a minute or two. Add the rest of the ingredients to your sauce and stir to combine. These look great- I’ll definitely try them both!